* Visiting and more food after the talk. The talks will be next door to our church in a very nice lecture hall we use. Our hall will be available at all times. "EVERYTHING IS FREE, but please RSVP"
“On the good ground are they, which in an honest and good heart, having heard the word, keep it, and bring forth fruit with patience.” Why did the Lord say “patience”? 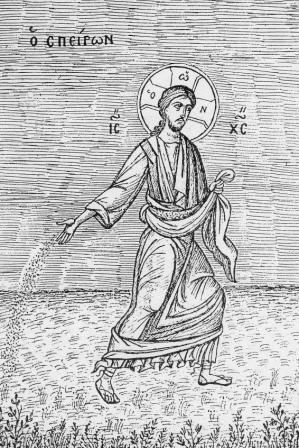 Synopsis: In the parable of the sower, the Lord concludes: "On the good ground are they, which in an honest and good heart, having heard the word, keep it, and bring forth fruit with patience." Why did He specify patience as the necessary virtue, and not faith, hope, love, zeal, etc? We examine patience, and how it is the active aspect of faith, hope, love and many virtues. How can we increase our patience? Luke 8:5-15 5 A sower went out to sow his seed: and as he sowed, some fell by the way side; and it was trodden down, and the fowls of the air devoured it. 6 And some fell upon a rock; and as soon as it was sprung up, it withered away, because it lacked moisture. 7 And some fell among thorns; and the thorns sprang up with it, and choked it. 8 And other fell on good ground, and sprang up, and bare fruit an hundredfold. And when he had said these things, he cried, He that hath ears to hear, let him hear. 9 And his disciples asked him, saying, What might this parable be? 10 And he said, Unto you it is given to know the mysteries of the kingdom of God: but to others in parables; that seeing they might not see, and hearing they might not understand. 11 Now the parable is this: The seed is the word of God. 12 Those by the way side are they that hear; then cometh the devil, and taketh away the word out of their hearts, lest they should believe and be saved. 13 They on the rock are they, which, when they hear, receive the word with joy; and these have no root, which for a while believe, and in time of temptation fall away. 14 And that which fell among thorns are they, which, when they have heard, go forth, and are choked with cares and riches and pleasures of this life, and bring no fruit to perfection. 15 But that on the good ground are they, which in an honest and good heart, having heard the word, keep it, and bring forth fruit with patience. “Having made peace through the blood of his cross, by him to reconcile all things unto himself…” – Basic (but not well known) Christology and what happened on the cross. Synopsis: Colosians chapter 1 contains one of the most succinct and clear descriptions of Who Christ s, what He did, how the cross was involved, and what we must therefore do. It is "Christology 101" and we must understand it and act accordingly. This is not your Baptist Grandmother's Christology or understanding of the cross! Parable! 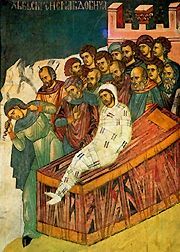 of the Resurrection of the Son of the Widow of Nain. Synopsis: The Resurrection of the son of the widow of Nain, like most miracles in the NT, must be read as a parable to receive the full benefit of its instruction. This miracle is our life in microcosm. We are both the woman and the boy in the "parable", and the words "Weep Not" do not fully apply to us now, but they will. In our life we must weep, with purpose and hope, and also "stand still", and only if we do this, will we receive the much anticipated words of our Savior, "weep Not". Apologies for the sound quality. The homily was inadvertently recorded at too low a volume, and the audio was massaged by an incompetent sound engineer! Luke 7:11-16 11 And it came to pass the day after, that he went into a city called Nain; and many of his disciples went with him, and much people. 12 Now when he came nigh to the gate of the city, behold, there was a dead man carried out, the only son of his mother, and she was a widow: and much people of the city was with her. 13 And when the Lord saw her, he had compassion on her, and said unto her, Weep not. 14 And he came and touched the bier: and they that bare him stood still. And he said, Young man, I say unto thee, Arise. 15 And he that was dead sat up, and began to speak. And he delivered him to his mother. 16 And there came a fear on all: and they glorified God, saying, That a great prophet is risen up among us; and, That God hath visited his people. 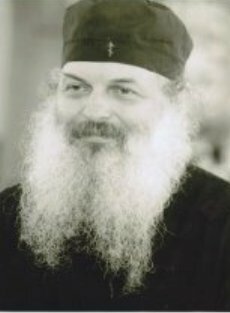 Why does a priest wear black? Joyful mourning, and the remembrance of death. Synopsis: An answer to a question posed in a prison visit: "Why do priests wear black?". The answer covers a lot of ground, from prison to abortion clinics to the pain of pastoral ministry and life in general for those who are paying attention, to Johnny Cash, who gave a superficially correct answer to this question, and of critical importance, "Remembrance of death" (which we speak of at some length) and "Joyful mourning"
“Launch out into the deep” – the first great catch of fish teaches about the Jesus prayer! 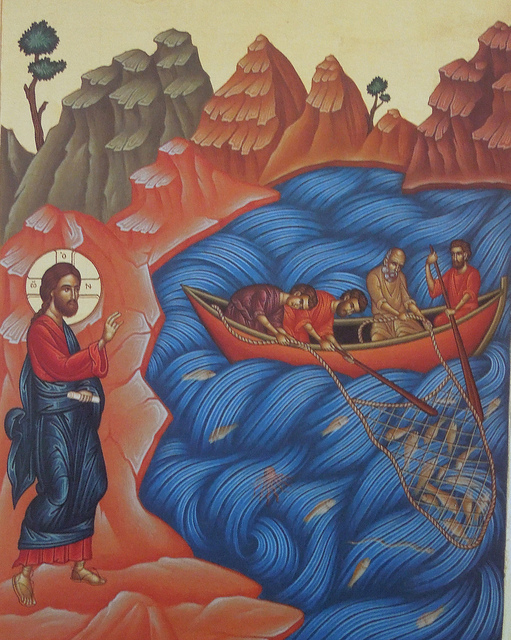 Synopsis: When Jesus commanded Peter to "Launch out into the deep, and let down your nets for a draught;", He was giving a principle, by which, and only by which we will stand in the presence of God, even in this life. This principle is all over the Scriptures. It involves patience, courage, obedience and INTENSITY. Although prayer is not explicitly mentioned, it is also about prayer, and especially about the Jesus prayer. How and why must we "launch out into the deep"? Luke 5:1-11 1 And it came to pass, that, as the people pressed upon him to hear the word of God, he stood by the lake of Gennesaret, 2 And saw two ships standing by the lake: but the fishermen were gone out of them, and were washing their nets. 3 And he entered into one of the ships, which was Simon's, and prayed him that he would thrust out a little from the land. And he sat down, and taught the people out of the ship. 4 Now when he had left speaking, he said unto Simon, Launch out into the deep, and let down your nets for a draught. 5 And Simon answering said unto him, Master, we have toiled all the night, and have taken nothing: nevertheless at thy word I will let down the net. 6 And when they had this done, they inclosed a great multitude of fishes: and their net brake. 7 And they beckoned unto their partners, which were in the other ship, that they should come and help them. And they came, and filled both the ships, so that they began to sink. 8 When Simon Peter saw it, he fell down at Jesus' knees, saying, Depart from me; for I am a sinful man, O Lord. 9 For he was astonished, and all that were with him, at the draught of the fishes which they had taken: 10 And so was also James, and John, the sons of Zebedee, which were partners with Simon. And Jesus said unto Simon, Fear not; from henceforth thou shalt catch men. 11 And when they had brought their ships to land, they forsook all, and followed him. Martyr Zosima the Wilderness-Dweller Commemorated Sep 19 – I AM A CHRISTIAN! Let's learn something today from the slave of God Zosimas the wilderness dweller. We live in difficult times. Almost nobody tells the truth anymore, and our society is becoming infested with legally enforced and subsidized immorality and depravity. Many who identify as Christian are no different than those in the world and their love for Christ is cold. I suppose the conditions are no worse and not better than those in which Zosimas live. He chose to reject all the depravity and become holy. That is the ultimate solution for all of us. The Martyr Zosima the Wilderness-Dweller lived during the IV Century. One time while hunting, the governor of Cilicia named Dometian caught sight of the elder, who calmly and amiably conversed with the beasts around him. Seeing the hunters, the beasts fled. They then interrogated the elder, — who was he and why did he live in the wilderness. The elder answered, that he was called Zosima, that he was a Christian, and that he was not able to live in the city with the enemies of the Lord Jesus Christ, and therefore he lived alone amongst the wild animals. Then Dometian said threateningly: "If thou dost worship the Nazarene, at Nazareth I shalt hand thee over publicly to fierce tortures, and thou wilt renounce Christ". To the question of what kind of magic Zosima used to tame wild beasts, the elder answered only: "I — am a Christian". 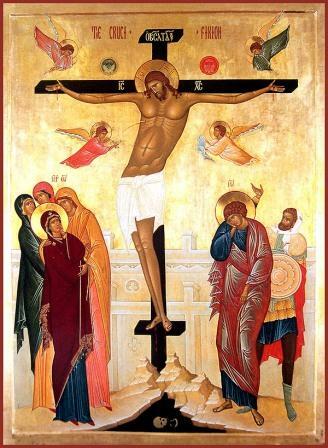 “I am crucified with Christ: neverthless I live; yet not I, but Christ liveth in me” – the Cross and the REMEMBRANCE OF DEATH, which is the ONLY way of life. Synopsis: We begin with an admonition from the Apostle Paul, in the selection read on the 17th Sunday after Pentecost: "Having therefore these promises, dearly beloved, let us cleanse ourselves from all filthiness of the flesh and spirit, perfecting holiness in the fear of God." This is the what, but most of a pastor's life is spent explaining the how, which the readings for the Sunday after the Exaltation of the Precious cross do very well. 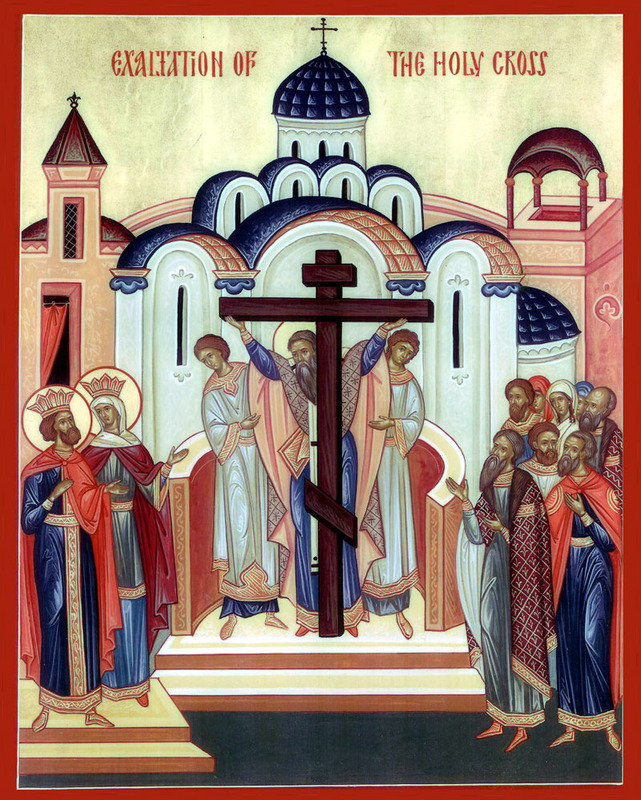 The Epistle ends with the stirring words " I am crucified with Christ: neverthless I live; yet not I, but Christ liveth in me…", and the Gospel tells us that "Whosoever will save his life shall lose it; but whosoever shall lose his life for my sake and the gospel's, the same shall save it ". These describe an attitude, a way of living. Without this attitude, we will not be able to make our way and be "perfecting holiness". One way to explain this attitude is to elucidate the uniquely ascetic and Orthodox understanding of the "remembrance of death"; this is CRITICAL stuff! We must understand this way of life, the ONLY way of life, which starts with baptism and the cross, and must continue in the way of the cross. Galatians 2:16-20 16 Knowing that a man is not justified by the works of the law, but by the faith of Jesus Christ, even we have believed in Jesus Christ, that we might be justified by the faith of Christ, and not by the works of the law: for by the works of the law shall no flesh be justified. 17 But if, while we seek to be justified by Christ, we ourselves also are found sinners, is therefore Christ the minister of sin? God forbid. 18 For if I build again the things which I destroyed, I make myself a transgressor. 19 For I through the law am dead to the law, that I might live unto God. 20 I am crucified with Christ: neverthless I live; yet not I, but Christ liveth in me: and the life which I now live in the flesh I live by the faith of the Son of God, who loved me, and gave himself for me. Mark 8:34-9:1 34 And when he had called the people unto him with his disciples also, he said unto them, Whosoever will come after me, let him deny himself, and take up his cross, and follow me. 35 For whosoever will save his life shall lose it; but whosoever shall lose his life for my sake and the gospel's, the same shall save it. 36 For what shall it profit a man, if he shall gain the whole world, and lose his own soul? 37 Or what shall a man give in exchange for his soul? 38 Whosoever therefore shall be ashamed of me and of my words in this adulterous and sinful generation; of him also shall the Son of man be ashamed, when he cometh in the glory of his Father with the holy angels. 1 And he said unto them, Verily I say unto you, That there be some of them that stand here, which shall not taste of death, till they have seen the kingdom of God come with power. 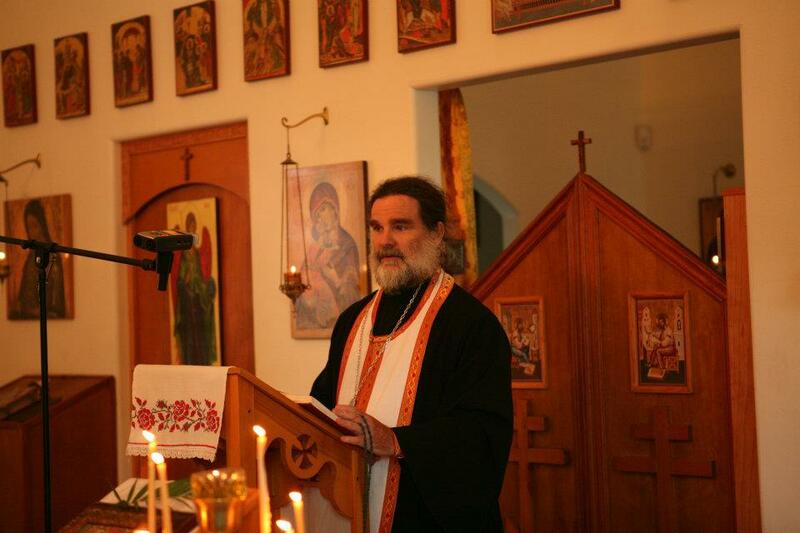 You are currently browsing the Saint Nicholas Orthodox Church blog archives for October, 2012.